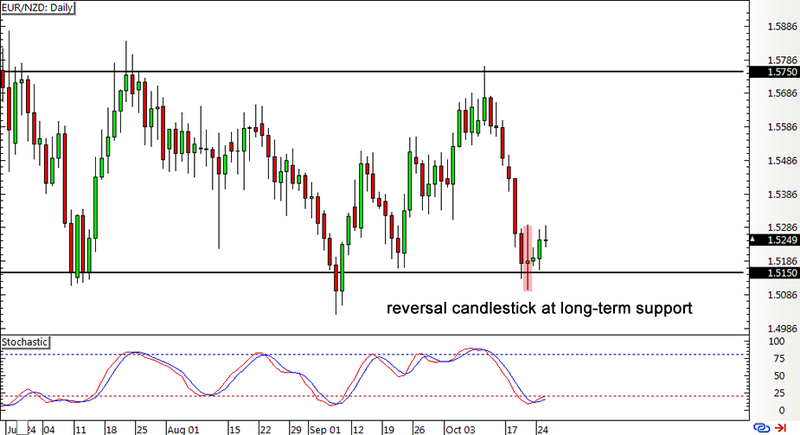 I spy with my one good eye a reversal candlestick right on the long-term support of EUR/NZD. Will the bottom of this daily range hold? This pair has sold off sharply in the past few days but it looks like the long-term range support is holding like a boss, with a spinning top to boot! The next few candlesticks are still showing a bit more hesitation so I don’t mind sitting tight and waiting for more confirmation, perhaps a bullish candle closing past the 1.5300 mark, before trying to catch this potential bounce. Besides, market sentiment ain’t in the euro’s favor right now, as forex junkies can’t seem to stop buzzing about a potential extension of the ECB’s QE program past the March 2017 end-date. Euro zone reports, however, are suggesting that the economic picture has been improving. For one, the latest batch of flash PMI readings from the region’s top nations have mostly been much stronger than expected. Updated inflation and growth figures are lined up from Germany, France, and Spain this Friday, and these should give a better idea of how the euro zone has been doing. As for the Kiwi, RBNZ rate cut expectations for their November meeting could continue to keep a lid on the currency’s gains. Earlier today, New Zealand printed a larger than expected trade deficit of 1.44 billion NZD spurred by a whopping 5.7% tumble in exports. This was caused by a 35% decline in meat exports and a 1.2% reduction in dairy shipments. I haven’t set any entry orders yet since I plan on waiting for a move past the 1.5300 near-term resistance before jumping in. I’m looking at the daily chart anyway, which means that I can afford to wait for a bit more momentum while looking at a potentially large upside up to the resistance at 1.5750 or at least until the middle of the range.